2University of Science and Research, Ahvaz Branch, Ahvaz, Iran. Received March 25th, 2011; revised May 12th, 2011; accepted June 23rd, 2011.
diagnosed with schizophrenia of different types were selected from two mental centers to participate in the study. awareness of the stages and processes during the course. in patients suffering from schizophrenia. severely distorted beliefs, perceptions, and thought processes (p.
and little or no disorganized behavior, speech or flat effect. of words spoken by others or imitations of movements of others. ideas and hallu c i n a t io n s .
tion or atrophy of brain tissue. normalities may not be genetic. the other is deficits that arise in the context of clinical illness. were successfully acquired during the developmental period. they shuffle into poor houses, county farms, and nursing homes. vey, Wilcox, & Boudjenah, 2005). 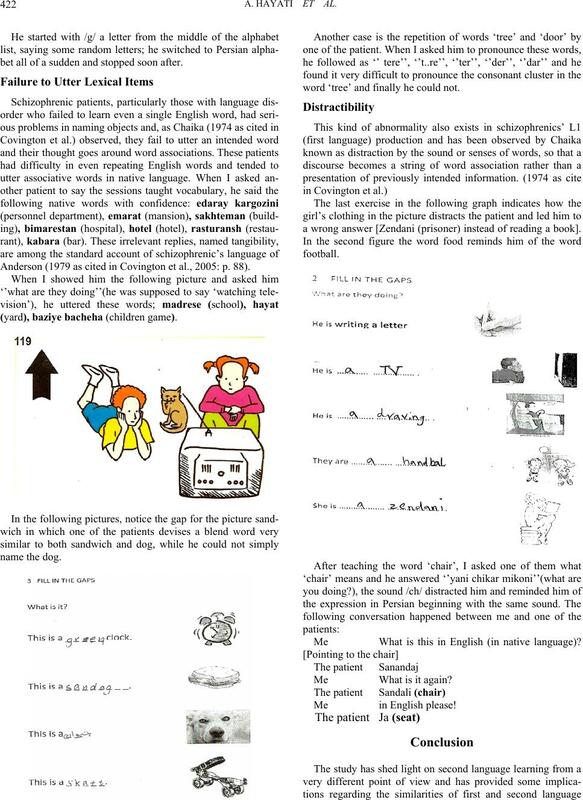 filling in gaps in sentences, memory games (p. 83). dealing with words as they occur in a lesson (p. 43). and incomprehensive and later on we see more formal disorders. tion, there is no connection in their belief (loosing association). mal language pathways are disrupted (DeLisi, 2004). of Anderson (1979 as cited in Covington et al., 2005: p. 88). and self-reference (talking about oneself excessively). 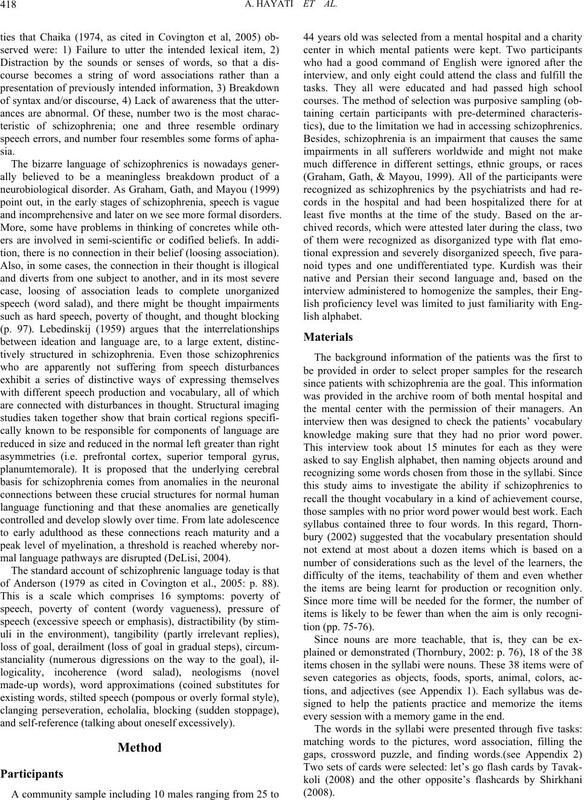 tics), due to the limitation we had in accessing schizophrenics. knowledge making sure that they had no prior word power. the items are being learnt for production or recognition only. every session with a memory game in the end. was shown in case they could not remember. final two require more mental ability on the part of the learners. done is shown and compared. downward while others are relatively doing well. Percentage of tasks by the patie nt s on m at c hi n g w o r ds to pictures. 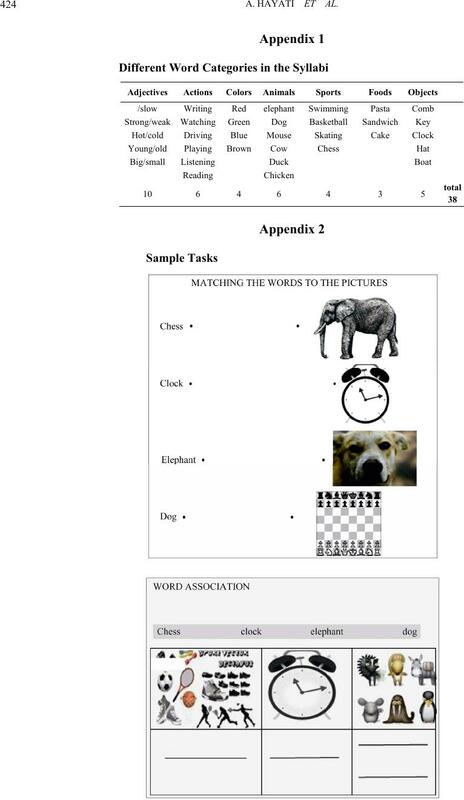 Percentages of tasks by the patients on word associ ation. 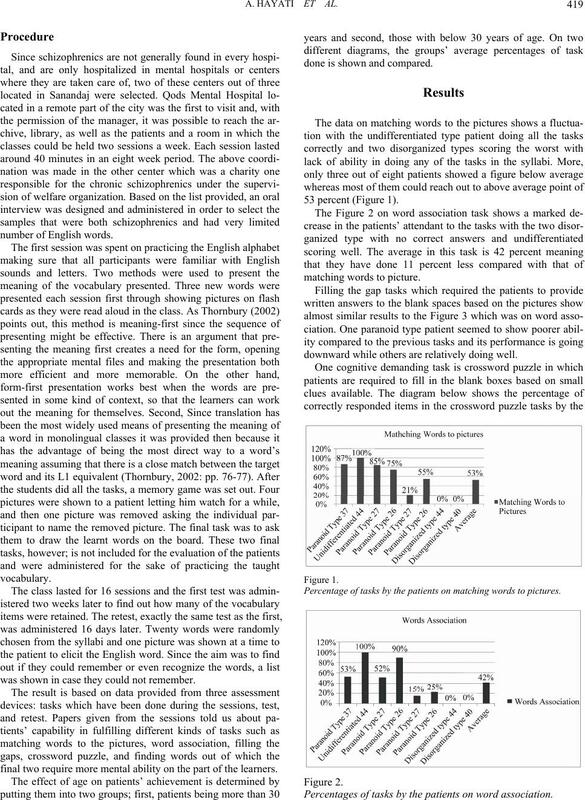 Percentages of tasks by the p atients on filling the gaps. 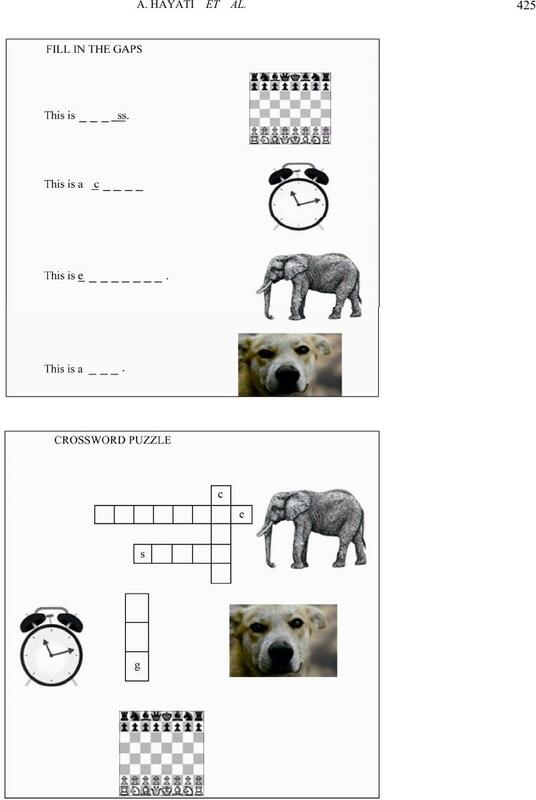 Percentages of tasks by the pati en t s o n cr o ss w o rd puzzle. shows a drop in the performance of patients in doing the task. tients hitting the trough and a marked decline in two of them. 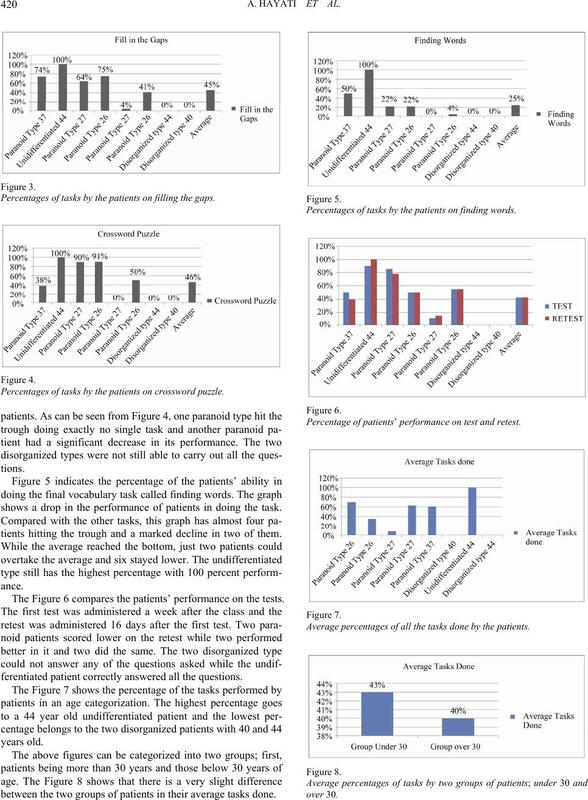 The Figure 6 compares the patients’ performance on the tests. ferentiated patient correctly answered all the questions. between the two groups of patients in their average tasks done. Percentages of tasks by the patients on fin di ng w ords. Percentage of patients’ perf o r m a nc e o n t e s t a n d r e t e st .
Average percentages of all the tasks done by the patients. lary. These can be categorized into six abnormalities. Average percentage of tasks d o ne by the patients. sense words and writing them in the blanks as for the answers. picture illustrates some of these abnormal language utterances. bet all of a sudden and stopped soon after. Anderson (1979 as cited in Covington et al., 2005: p. 88). (yard), baziye bacheha (children game). word ‘tree’ and finally he could not. a wrong answer [Zendani (prisoner) instead of reading a book]. Me What is this in English (in native language)? Me What is it again? 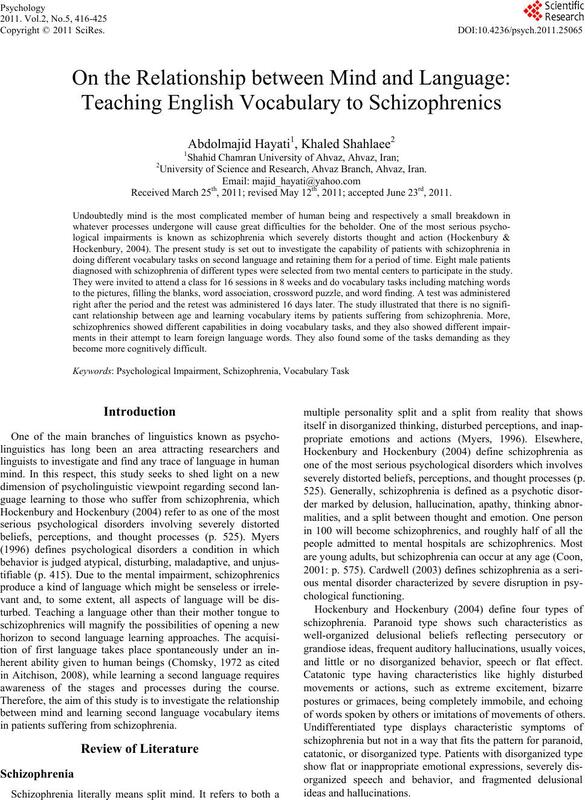 learning from a psycholinguistic perspective. harder they found it to do. 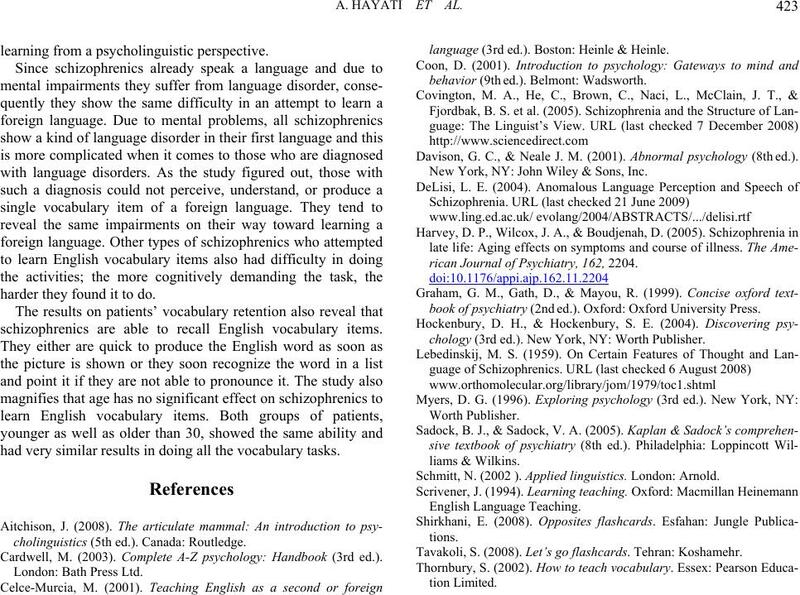 schizophrenics are able to recall English vocabulary items. had very similar results in doing all the vocabulary tasks. 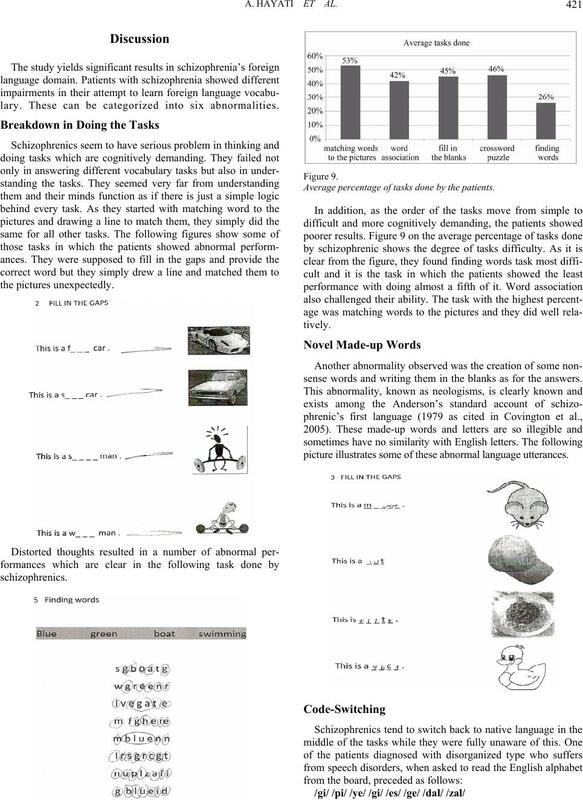 cholinguistics (5th ed.). Canada: Routledge. Cardwell, M. (2003). Complete A-Z psychology: Handbook (3rd ed.). language (3rd ed.). Boston: Heinle & Heinle. behavior (9th ed.). Belmont: Wadswor t h.
Davison, G. C., & Neale J. M. (2001). Abnormal psychology (8th ed.). New York, NY: John Wiley & Sons, Inc.
rican Journal of Psychiatry, 162, 2204.
book of psychiatry (2nd ed.). Oxford: Oxford University Press. 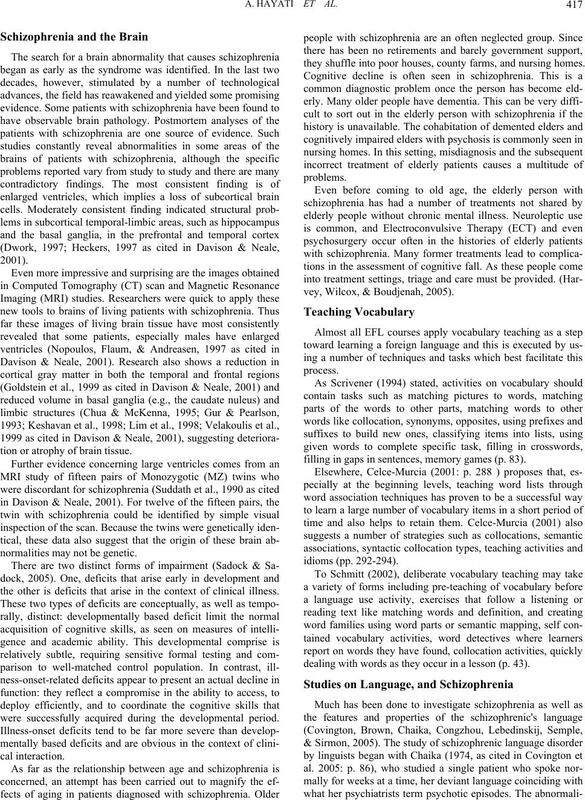 chology (3rd ed.). New York, NY: Worth Publisher. Schmitt, N. (2002 ). Applied lin g ui st ics. London: Arnold. Tavakoli, S. (2008). Let’s go flashcards. Tehran: Koshamehr.